The distinctive klaxon horn of the 87 year old Franklin heralded its arrival at Rat Park. 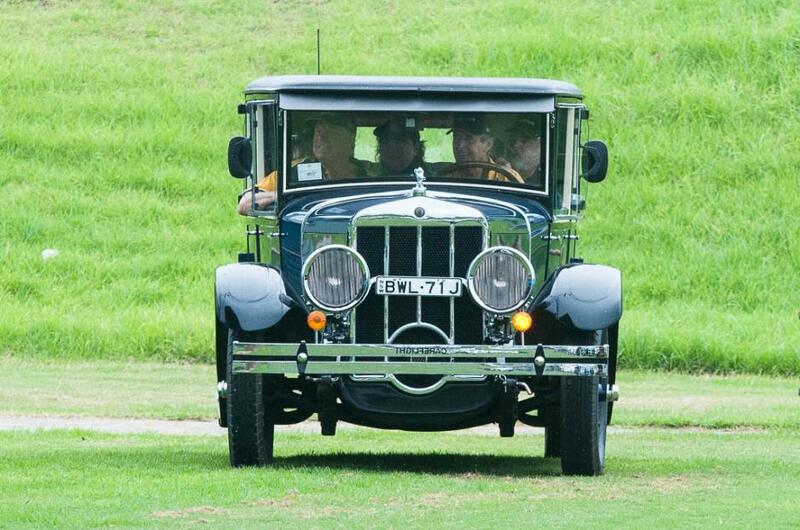 With 27,250 kilometers of round Australia behind it, spectators in the stand gave the classic car a warm welcome at the home coming. Owners David Rundle and Geoff Morris emerged to be welcomed by Ian Badham, Founding Director of CareFlight the major beneficiary of the Round Australia's fund raising activities. 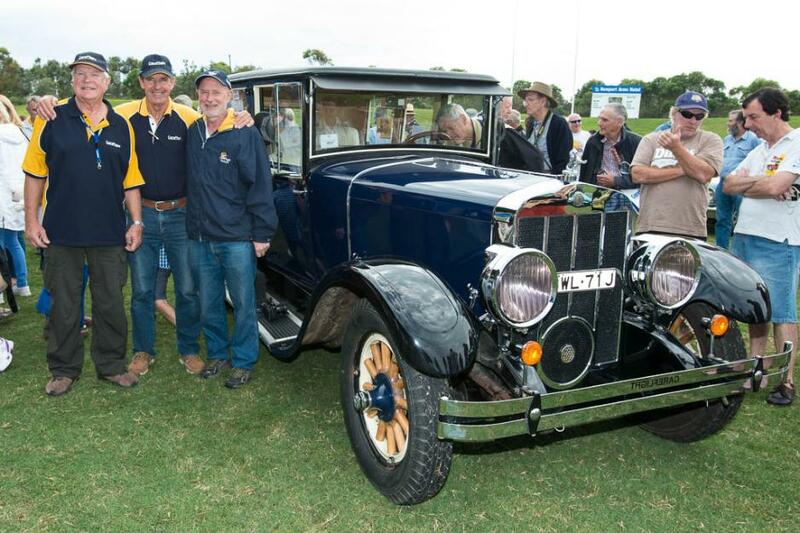 David thanked the 100 people in the crowd and all those came with their own classic cars to be part of the Franklin’s return to Pittwater. The trip has raised approximately one dollar per kilometer travelled. Much of the funds raised came from unexpected sources in the remote area of the country and David expressed their gratitude to the many outback supporters who not only donated to CareFlight but who assisted with superhuman vehicle repairs when necessary. This is the first time that an air-cooled Franklin has been around the country and it attracted attention and smiles on the faces of children wherever it went. Seven hundred and twenty six days after the 1927 Franklin 11B left Mona Vale Beach, ‘Franki’ is back with a few new replaced parts but overall in remarkably good condition. The trip took in every state in Australia but when asked, David was reluctant to single out one highlight. “We have seen some wonderful country but most of all met some incredible people” said David. The $27,000 raised will go to CareFlight’s Early Trauma training for the emergency services who are often first on the scene at this most critical time. The day after his arrival, David Rundle spoke with Michael Mannington. David, what did you think of your Rat Park arrival? 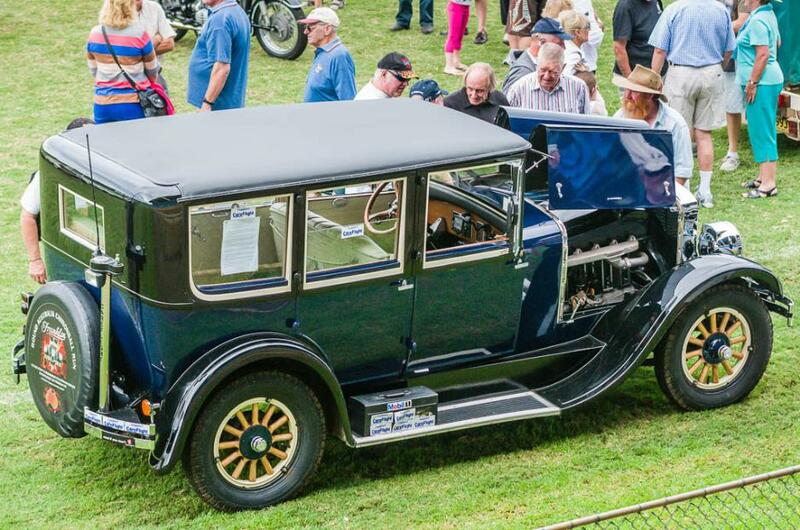 It was a fantastic event even bigger than I had imagined because it was organised by CareFlight and I was not involved and I found to my surprise and delight a couple of hundred people, two lines of classic cars and motorbikes, it was quite fabulous. As soon as we started speaking with the microphone, the Qantas and Emirates 380s came over the park and did three circles and it looked just as if they were welcoming the Franklin. The Qantas welcome was appropriate after travelling 27,250 km which is a big number. Going round Australia there is a short lap and a long lap which we did and we went into places that are well off the normal route including for example parts of the Gulf Country where certainly caravans would not venture. And of course we got permission with the Northern Lands Council to go into Arnhem Land and at that stage we were carrying an American medical doctor from Portland Oregon with us and he was interested in seeing the medical facilities up there so we had to go down some wild tracks but we discovered that the countryside is as beautiful as anything you would ever find plus lots of crocodiles and snakes. When experiencing these remote locations does this give you a better insight into the the challenges of these areas? We see a lot of travelogues and many travelogues are just the same as others. We saw some of the difficulties associated with communities such as drugs and petrol sniffing but we all know that. However it’s not all bad and I think people in those areas need to be able to determine their fate as opposed to armchair critics in the cities. You need to be onsite to see what is happening. What were some of you daily experiences? When we drove into a remote town the Franklin would turn heads and get a lot of smiles as well which makes you feel good and the kids wave at you and you sound the klaxon horn that the kids love. Then we go to as many schools as we can and get the kids in the car or sit them around the car and ask them what they see and it is amazing what they observe. They see wooden wheels and a windscreen that opens and say that its free air-conditioning. They see doors that open the other way to a normal car, incidentally we call the suicide doors, kids see all these things and the mascot and chrome etc. And those little inquiring minds will become the beneficiaries of the future CareFlight services. Tell me about the CareFlight people you met. CareFlight came to talk to the Pittwater Motor Enthusiasts Club in Mona Vale and the club decided to put some funds towards supporting CareFlight. Word reached CareFlight that we were planning to circumnavigate Australia in the Franklin and they asked if they could come onboard and use CareFlight is our charity. This we did and we have now donated almost $27 thousand which is almost a dollar per kilometer and in doing this we have raised awareness particularly in smaller remote communities such as Shark Bay. From the numerous stories about people helping you in remote areas, can you give an example. In the Gulf of Carpentaria we broke a torsion bar crossing the Leichhardt River, terribly bumpy with big corrugations and we were between Normanton and Burketown at this stage. The road was narrow so we pushed the car into the scrub, found a boulder so we can jack up the car with the boulder as a safety stop so the car could not fall on us. And then you start pulling it all apart which means both axles have to come out. You are getting covered in grease and suddenly this old truck pulls up and when the dust settles a bloke jumps out and this lovely looking lady in blue shorts, all the boys noticed, his wife comes out and said “Would anybody like a cup of tea?” And that’s when a cup of tea really tastes good. We pulled the vehicle with a special ‘A’ frame which we had built before we left to allow us to pull the car if necessary. We pulled into a place called Floraville Downs, 940 square kilometers where we were met by the lady of the station Kylie Camp who was in really shabby gear and you would not know if she was just a rouseabout or if she owned the place. She invited us to go to a shed which had no walls but had a concrete floor and said stay as long as you like and join us at the table for dinner. We were 14 for dinner that night and the rest were ringers and station hands and her husband Ernie came in that night on a horse returning after being away for a week on horseback working on the station. He said “No grog allowed”, welcomed us to his property and proceeded to say grace before the meal. He then started to talk about archeology, prehistoric animals found in the area and we discovered that the place was subject to what is called the ‘Floraville Dig’. Here was found a huge prehistoric giant wombat and he showed us some of the bones and suddenly you are off on a tangent into somebody else’s life, just wonderful people. I said to them we needed a lathe and they explained there would be a lathe in Burketown but as it will be Sunday we will ring the fellow from the Council depot. So it was a 170 km journey round trip to get the keys to open the depot to use the lathe, which we had to fix to get it going, to trim the axle so that we can put a bearing on. Then back to Floraville Downs, we had to put the axle in the deep freeze with the barramundi to get it really cold. We had to put the bearing in Kylie’s stove which was really hot and we managed to sweat the bearing onto the axle and that got us going. Are you happy to be back in Pittwater? Pittwater will always be the place I want to live. As a kid I went surfing at Bilgola because that’s where the good looking girls were and then it was off the the Arms in the MG TC I had at that time. The Franklin is going to have a rest, it needs a new clutch and the mudguards need repainting but there is not much wrong with it now although we had that motor explosion in Tasmania. That was really serious until friends of ours in the US found the barrel part we needed, shipped it to Minnesota from San Diego, had it resleeved to our cylinder size and one of American friends bought it over to us. That was all within 10 days to keep us going so we could roll into Rat Park on time yesterday. Thanks David, good to have you back. Just before you go come and see what I now have in the garage. And that’s a story for another day. Franklin owners David Rundle and Geoff Morris with Ian Badham, Founding Director of CareFlight. Words and Images by Michael Mannington, 2013. all Rights reserved.